Why Customized Travel Services are Trending? Nowadays, thanks to the internet, information is readily available to consumers, and this makes them armed to demand whatever they like from businesses. If the business in question doesn’t offer what they want, consumers can readily switch to another vendor. Similarly, they can skim through the entire industry in search of a travel services agency that suits their needs. No longer are customers satisfied with pre-packaged goods; they want and demand personalization and individuality. Here are some of the reasons why customized travel services are all the rage nowadays. Consumers feel that a luxurious travel experience isn’t all about staying in 5-star hotels and drinking the best wine, but rather that they get to enjoy a tour that is specifically designed for them. This is especially the case for frequent travelers who have already experienced many group vacation packages and pre-planned escorted tours. When opting for a completely customized trip, travelers get to experience the real value in it, and it is more than just a hefty price tag. The price of a pre-planned tour and a personalized vacation is very different, but with the latter, consumers see the actual value. On the other hand, even visiting a glamorous destination on a cheap ticket won’t feel as special if there isn’t a distinctive touch to it. Time and again, customers have expressed that if they can get special considerations and requests for the extra price, they would pay for it. There’s no doubt that when travelers go sightseeing on their own versus with a group, they’ll have more fun when they’re allowed to explore at their own time without being bound by time constraints of a fast moving tour. While new travelers may be satisfied with pre-planned travel packages, it’s the wanderers who are rigid with their preferences. Thanks to the internet, they can learn about important sights well before visiting the scene, so they can take their time observing and exploring without the need for a guide. There are a few types of customized trips that are more common with the population of travelers, than other types. Although an escorted tour seems like the opposite of a personalized trip, they are commonly merged so a private guide shows the travelers around. This is common among older and retired travelers who prefer that someone have an organized plan as to where they will go, but also want to avoid the noise and distraction of a group tour. Customized vacation packages are a favorite among the younger demographic because they allow them to enjoy a distinctive experience at venues of their choice. They can approach the travel services agency with a list of places they would like to visit and stay at, and their agent can arrange it for them in a way that is manageable and comfortable with the client. Custom booking of air fair – booking international airline ticket is a huge pain in the neck. From non-stop flight to multiple stops flight can have a considerable difference among the airfare. Travel agency usually has a good way to find the best trip at the lowest cost with less layover time or even red-eye flight. Car Rental – Car rental is almost a must when traveling alone or with a group. The travel agency has access to the inventory of rental cars including RV, exotic car, luxury car, and transportation company. Luggage Shipping – Many people choose to ship their suitcase and luggage through FedEx or UPS to their next destination before arrival the place. This cost can dramatically increase if you don’t plan your trip ahead. Cruise Trip – This is the most common customized trip among the travel industry. The travel agency has a central database to access the massive amount of the cruise packages at a better rate than booking them individually online. The travel agency also often have access to the excursion with a better price than booking it on the cruise ship. Hotel Stay – The travel agency also have wholesale access to the hotel. From luxury 7 star resort, time-sharing exchange network to the privately owned hotel in the countryside, the traveler can usually save money by having the travel agency booking the hotel for them. All inclusive Travel – This travel planning includes private travel. Executive travel, and luxury travel without the compromise. It’s also one of the most profitable travel types for the travel agency. Destination Travel – Destination Travel includes golf tournament, specific destination such as Africa Safari tour, mountain tour, luxury auction tour and private event at a specific island or countries. These are some of the most sought-out and profitable travel packages that an agency can offer to a customer. Although it may seem unlikely, there is a large number of thrill seekers who commonly approach travel agents with requests to arrange a trip for them where they can enjoy hiking, camping or even diving. While some may prefer skydiving or mountain climbing, others will want horseback riding or finish, so be prepared to offer most of these activities in your package. This targets the older population of grandparents who have retired and are now looking to spend some time exploring the world. These elders, however, aren’t weak and frail according to the perceived stereotype, but rather more energetic and lively. They prefer vineyard tours and trips to historical sites, along with a comfortable stay at a nice hotel that takes their eating habits into consideration. These have been a profitable area for travel service agencies since the very start; numerous couples are busy in planning out aspects of their wedding so they feel like approaching a travel agent with their idea of a perfect honeymoon is the best thing to do. They give the agent a summary of what they would like to do and where they would like to go, stay and dine, and the agent organizes it for them. There are more people choosing luxury travel nowadays. From booking the private jet, luxury hotel suite stay to customized private tour at the winery, and golf resort and auction events, Luxury travel is a hot trending. Use social media in a way that is strategic and effective at drawing in clients. Ask your previous clients to share videos or pictures of trips they booked through your agency with a unique hashtag or something of the sort. Make yourself a specialist in a certain field. Although it’s important that you offer travel services to every client, make sure that you’re a specialist in the latest traveling niche that is trending now. Make sure to meet with your clients rather than speaking with them over the phone. Any habits or appearance they display can tell you a lot about what type of customized travel package will be adequate for them. Get their input as to what they would like; when you have everything to offer and they see that all their requests are met with consideration, they will be more likely to seal the deal. Ask about their specific preferences; if a client observes that you take special care in accommodating travelers, they may opt for a more customized vacation. Lastly, it’s crucial that you have the right travel agency merchant account to process all these payment transactions from your customers. Having the right merchant account for your travel service and or travel agency makes all the difference to growing your profits and customer base. The right credit card processing account that is specifically tailored for Travel Service merchants and businesses owners allows you to accept payments for all your travel services without fear of being shut down due to high ticket size or how far in advance the travel is booked and paid for by your customer. Without a secure and efficient way to receive payment from the customer, no business can make a good profit. One of the most important ways to increase your travel agency profit is to be able to accept credit card payment, e-check payment, recurring payment and be able to process the payment on a desktop computer in the office as well as on-to-go with a mobile app or portable POS system. 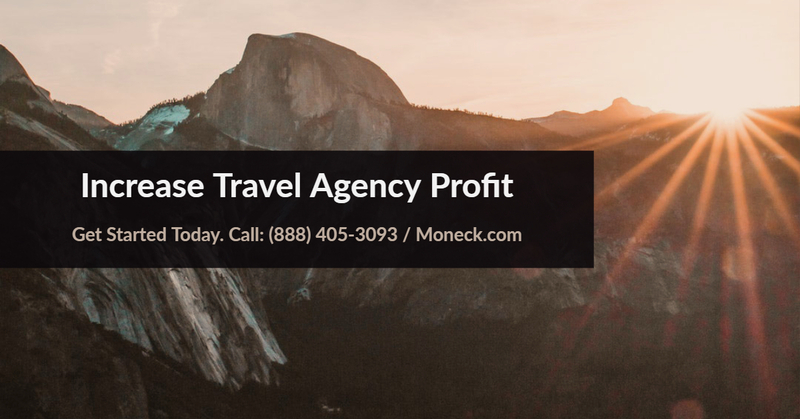 The travel agency is considered a high-risk business, which means the higher processing fee and potential chargeback can bring down the business profitability. Find the right payment solutions for your travel agency is the most important key to ensure your merchant account is stable and profitable. With Moneck.com, you can apply for a travel service / agency merchant account, even if you’re a new startup that is high-risk in nature. 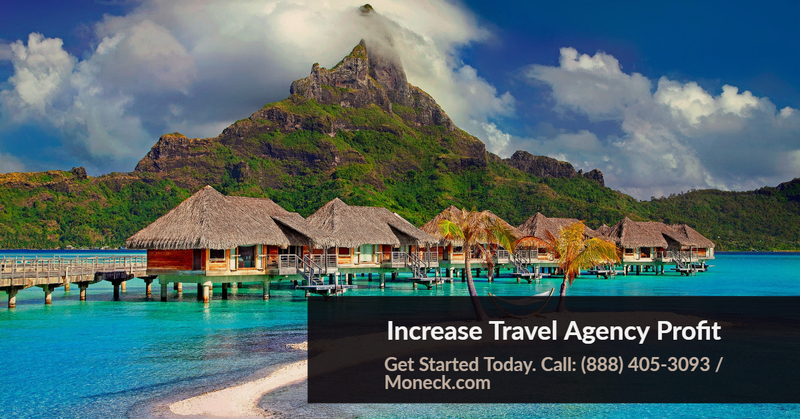 Moneck Payment Solutions is a leader in providing payment solutions for travel service and travel agency businesses. Their payment solutions offered provide the latest in technology and security in accepting payments from your customers. They can be reached Monday through Friday between the hours of 9am to 5:30pm PST at 888-405-3093.